Wisdom tooth pain can be caused by a couple of things. I will list the most common problems first! Probably the most common wisdom tooth problem I see is where a wisdom tooth has started to come through the gum on the lower jaw. The gum is red and sore around the new tooth, and even a little swollen. Sometimes the patient cannot open their mouth very wide. The problem here is twofold. First problem, the tooth is irritating the gum as it grows. "Teething"! As long as the tooth has enough room to grow, and is pointing straight up, it will eventually come through the gum properly, like any other tooth. But while it's growing, it can be quite sore. The best remedy at this time is rinsing around the gum with hot salty water, and taking some ibuprofen ("Nurofen"), or paracetamol. The second problem arises if the tooth does NOT have enough room to grow through, and gets jammed against the next-door tooth. Any wisdom tooth that cannot come through straight is called "impacted". Now it is stuck halfway in and halfway out. The gum is sore and swollen. And plaque starts to collect around the tooth, because it's difficult to get a brush back there. So now there is infection, too! This is when it can get difficult to open your mouth wide. 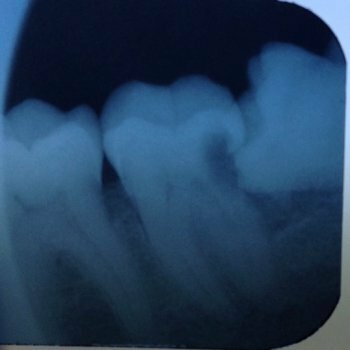 In the image above, the wisdom tooth on the right is lying on it's side, jammed up against the next tooth, and it has caused a cavity in the side of the neighboring tooth. At this stage, hot salt water will help, but you probably need some antibiotics as well to help settle things down. After that, you might need to see about getting the tooth removed. If the tooth is lying on its side, under the gum, it will probably never come through the gum. But it can grow against the next tooth. This pressure can cause a dull ache which may become quite intense. The wisdom tooth will not be able to move, and the roots will continue to form. This continuous pressure may cause part of the next tooth to erode, leading to a cavity. Unfortunately, this can lead to both teeth having to be removed. The next most common problem I see is an UPPER wisdom tooth that has grown through as normal, but then starts hitting on something. Sometimes it comes through at an angle, pointing out towards the cheek. Of course, in this position, the tooth irritates the inside of your cheek. It can even cause a semi-permanent ulcer. If it is pointing in the right direction, (straight down), and the lower wisdom tooth is not there, then the top one can start to hit the lower gum when you chew. Ouch! Quite often, the upper tooth is hitting on the gum of the lower jaw, and the lower wisdom tooth is half-way through, but jammed on the next one along. Double whammy! In this situation, the lower jaw is painful, but the quickest and easiest treatment is to take out the TOP tooth. This stops the biting on the lower gum, and makes things more comfortable very quickly. In due course, the lower tooth will have to be removed too. More rarely, an impacted wisdom tooth can get a cavity. In this case, you get a normal toothache. Again, the solution is usually to have the tooth removed! Wisdom tooth pain can have one of several causes. As long as the tooth has enough room to come through, it will usually settle down. Frequently, however, the tooth does NOT have enough room, and will need to be removed.